Casein Custard By Gen-Tec Nutrition - Big Brands, Warehouse Prices! 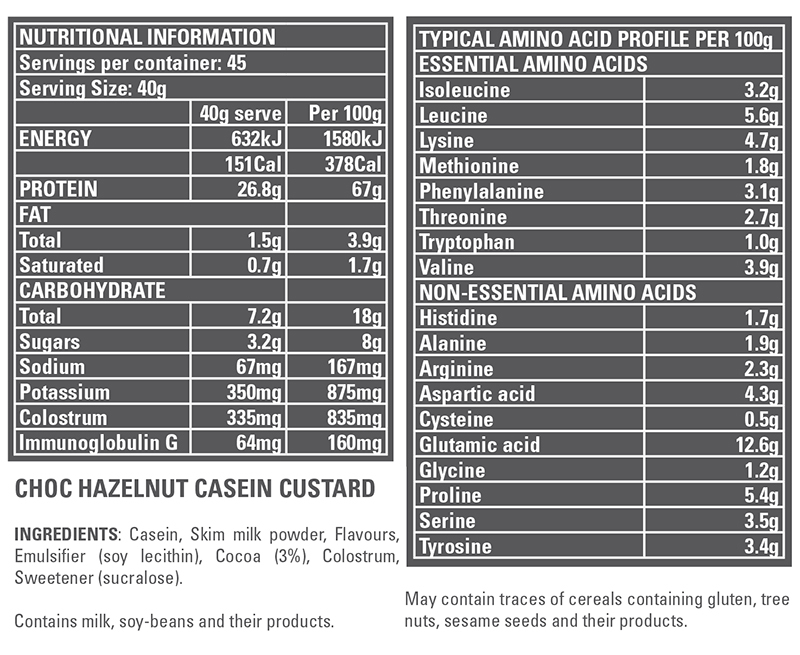 This protein custard from GenTec contains high amounts of BCAAs and L-glutamine precursors. It has an ideal amino acid profile for anyone with the goals of increasing lean muscle mass and improving recovery. This premium and slowly digesting protein is ideal for consuming prior to episodes of fasting (like sleep) as it digests over a considerably slower time frame to many other protein varieties. It's fortified with colostrum with a minimum of 35 percent "immunoglobulin-g". It has been discovered that colostrum offers a wide spectrum of health benefits for adults ranging from immunity support and digestive support. This is a delicious treat to be used as suggested for the tastiest and most convenient way to supply a slow sustained release of aminos to your muscle tissue during sleep. This product is available at Nutrition Warehouse in Smooth Chocolate Custard, Smooth Banana Custard, Choc Honeycomb Custard, Coconut Cream Custard and Caramel flavours in a 4lb (1.81kg) size option. Mix 60g (3 scoops) in 200ml - 350ml of cold water or milk and shake it well. Incredible with a blender; lumps with a shakerReview by e.s. 5 stars for the product if you've got a blender on hand. The mixability of this product is very overstated, but apart from that, it's incredibly delicious. I recommend buying plain chocolate flavour and then blending it up with hazelnuts, cinnamon, or peppermint essence - or sprinkling some coconut flakes on top.